Easter morning is a flurry of activity in our home. The children wake up early in the morning to see what goodies the Easter Bunny has left behind. The “SMARTIES Nestlé Twist N Pour Bunny” was a favourite treat left behind by the Bunny. 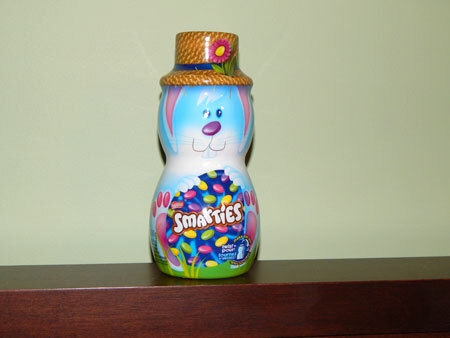 The “SMARTIES Nestlé Twist N Pour Bunny” is a 250g bottle of Smarties in an adorable Easter Bunny wrapper. The top of the Smarties bottle twists off allowing you to pour out the perfect amount of Smartie treats. The cap is designed to hold approximately 15 smarties, making it easy to portion out your Smarties. The Smarties have a slightly different taste that I prefer over the ones found in the Halloween packs. The candies seem to be slightly fatter and have less vibrant colours. The “SMARTIES Nestlé Twist N Pour Bunny” is a fun way to share Easter treats with friends and family. *Disclosure: I received a complimentary “SMARTIES Nestlé Twist N Pour Bunny” through the Amazon Vine Program in exchange for my review. All opinions are 100% my own.